Arla Foods Germany is the first company to opt for the innovative SIGNATURE PACK from SIG – the world’s first aseptic carton pack that is 100 % linked to plant-based renewable material. Arla Foods Germany is the first company to opt for the innovative SIGNATURE PACK from SIG – the world’s first aseptic carton pack that is 100 % linked to plant-based renewable material. 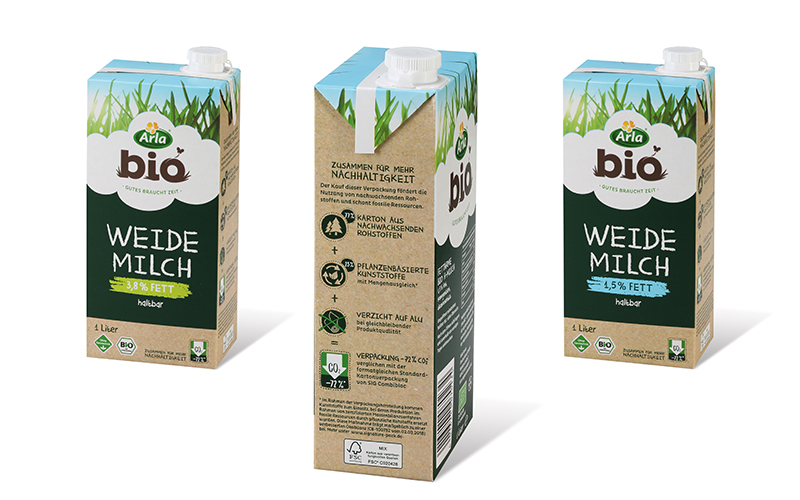 Arla now offers its 1 litre 1.5 % and 3.8 % organic milk (Arla® BIO Weidemilch) in the SIGNATURE PACK. By choosing SIG’s innovative SIGNATURE PACK, Arla is demonstrating its commitment to sustainability as it strives to increase the market share of its organic dairy products. Arla’s organic milk cartons now carry a clear message to consumers: buying this pack promotes the use of renewable raw materials to protect fossil resources while making a positive impact in reducing the CO2 level compared with a standard carton pack. SIGNATURE PACK cartons are made from 77 % paper board from wood and 23 % plant-based polymers through mass balancing. This means that for the polymers used in the SIGNATURE PACK, an equivalent amount of bio-based feedstock went into the manufacturing of the polymers. To ensure the integrity of this process, the mass balancing is certified through internationally recognised third-parties. The packs are aluminium-free, while maintaining product quality. Their carbon footprint is 72 % lower than a standard SIG carton pack of the same format, based on a life cycle assessment (CB-100732 of 02.03.2018) carried out by independent experts using the ISO 14040 international standard. These credentials are displayed on Arla’s organic milk packs, together with the FSCTM label which shows consumers that the wood-based content comes from well-managed forests and other controlled sources in accordance to FSC requirements. The polymers that make up the rest of the SIGNATURE PACK cartons, including the barrier and the spout, are linked to 100 % plant-based material using recognised and audited certification schemes (ISCC PLUS and TÜV SÜD CMS71) to ensure strict traceability and accountability.